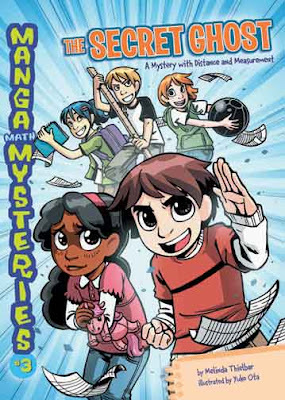 MANGA MATH MYSTERIES is not high quality literature in the sense of reading stories for pleasure. In fact, I would venture to say that most kids would not pick up and read them for fun. Unlike some other specialty books that try to trick kids into reading by subversively pushing an educational goal – which kids can always detect – it is no secret to the reader (children or adults) that these books have an agenda: teach children mathematics by connecting arithmetic to real life scenarios. I think that openness is where these books will work for teachers and for students. I would never attempt to con kids into using these titles to promote a love of reading, unless the child is a serious math enthusiast. Those who are drawn to math may pick them up on their own, but most will not. However, I think elementary students will go along with the ride when a teacher is up front about using math comics as the basis for a lesson. Which would you prefer: mathematics textbook, math worksheets or an math-based comic with real world applications? The art is designed specifically for children. Manga is big with many kids and adults for that matter. MANGA MATH MYSTERIES is brightly colored with limited background work. The text balloons are easy to read and the panel work is layered but uncluttered. A teacher could use MANGA MATH MYSTERIES as a culminating event to an arithmetic lesson, which in this case is on distance and measurement designed for the grade level teacher. As the technology instructor, I used it to as a way to use technology to reinforce the grade level classroom curricular standards that must be assessed. Click here for the detailed lesson plan. Doing so allows the students to stretch their limits and take risks regarding mathematics (or any other subject for that matter) and apply it in new ways without risking their classroom grade. However, I could (and should have although I didn’t think of it at the time) have offered the grade level teachers the solutions and strategies produced by the students, so the grade level teacher could assess which students were able to understand and apply the arithmetic skills in a new situation and which student required more one-on-one tutoring. Those types of collaborations are what build strong educational communities. There are eight titles in the series, all addressing mathematics and all available in library binding or ebook format.